Vietnam, a leading indicator for the rest of the developing world, has seen tremendous growth in per capita energy consumption. Let’s start with some basic facts: Vietnam has seen extraordinary growth in per capita energy consumption over the past several decades. 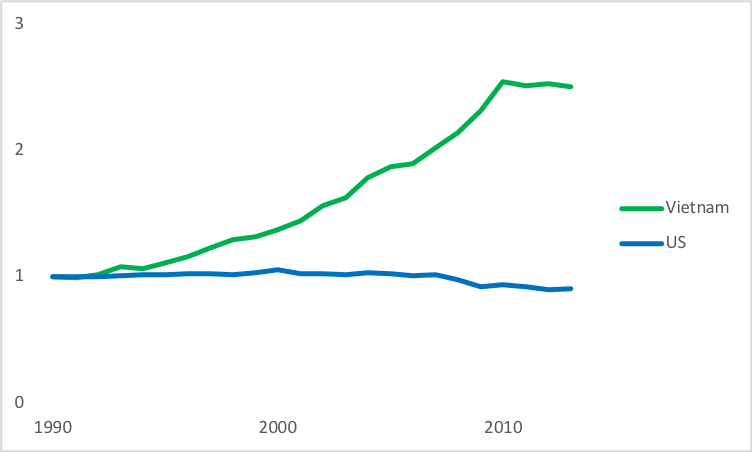 Since 1990, the earliest year for which data are available for most countries, total per capita energy consumption in Vietnam has more than doubled. (All the country-level data in this post come from the World Bank Development Indicators.) This puts Vietnam in the top 3% of countries in the world in terms of growth in per capita energy consumption. Of the countries with more than 5 million people, only China and Thailand have had more rapid growth. Some of my previous research suggests that a growing middle class will drive rapid increases in energy consumption. As people come out of poverty and enter the middle class, they buy their first refrigerator or motorbike, or they take their first airplane trip. Those things require energy, as does building the infrastructure to support them. 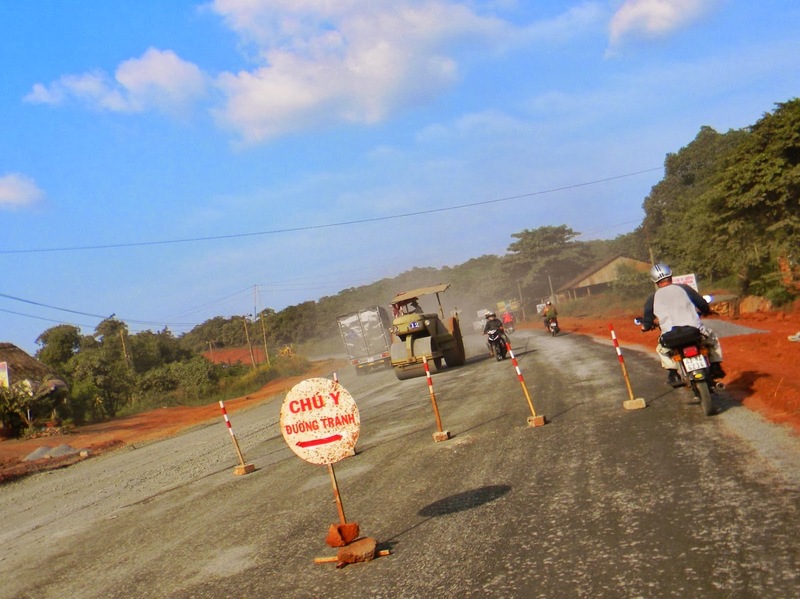 We saw a whole lot of road construction and brand-new highways and bridges as we drove around central Vietnam. Paul Gertler, Orie Shelef and I analyzed data from around the developing world and noted a distinct pattern in the relationship between household income and energy use. When households move from extreme poverty to just being poor, energy use does not increase by much. These households typically use their growing incomes to consume more calories or higher quality calories. At the other end of the income distribution, when households move from middle to upper middle class, their energy use also does not change by much. It’s when households move out of poverty and into the middle class that their energy consumption really jumps. This suggests that a dollar of GDP growth will have very different implications for energy use depending on what type of household gets it. When a country’s economic growth lifts many people into the middle class, its energy consumption grows quickly. This is where Vietnam is a standout. Income inequality in the country is quite low, possibly a legacy of communism. We saw signs of the thriving middle class everywhere, from the intersections clogged with motorbikes to packed domestic flights. Our research suggests that the existing forecasts of world energy demand do not adequately account for growth driven by the rising middle class across the developing world. This omission could help explain why existing forecasts under-predict growth in energy demand, as I’ve blogged about earlier. Vietnam’s hot and humid climate is another factor driving growth in energy consumption. Leo Biardeau, Lucas Davis, Paul Gertler, and I have some ongoing work documenting what we describe as “air conditioning potential” across the globe. This is basically a very fine-grained assessment of where people live and how many hot days they experience in a typical year. Vietnam has nearly 100 million people, all of whom live closer to the equator than the whole Continental US and experience lots of hot days. If people in Vietnam used air conditioning the way Americans do on similarly hot days, Vietnam’s AC-driven energy consumption would equal the US’s, even though the population is one-third as large. This isn’t just a theoretical possibility, either. Vietnam is starting to realize its air conditioning potential. From 2012-2016, air conditioning sales grew by a whopping 160%. Again, much of the developing world experiences warmer climates than the global north, so places like India and Sub-Saharan Africa are poised to see rapid increases in energy demand for air-conditioning. Finally, Vietnam has made incredible progress on rural electrification, and is frequently cited as a role model at conferences I attend. Household electrification rates increased from 2.5% in 1976, just after the war ended, to over 99% in 2014, the last year for which the World Bank provided data. This World Bank report provides a fantastic overview of the process. It describes the “bottom-up” approach, particularly during the early years. EVN, the utility, was responsible for building the network to the communes and then a variety of local governments and organizations built the last-mile local distribution system to bring electricity to households. The local organizations continued to maintain the system, set prices and collect bills. Tariffs were not unified on EVN’s system until 2009. It’s important not to mistake growing energy demand in Vietnam for high levels of demand. The average Vietnamese person consumes one-tenth of the average American. But, given that the government of Vietnam is forecasting 8 to 10% growth in electricity consumption in the near term, Vietnam could catch up pretty soon. 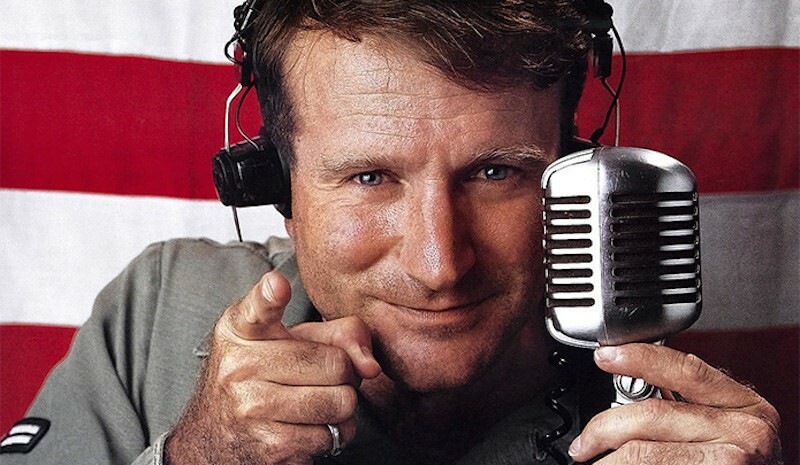 So, “Good Morning Vietnam”, a la Robin Williams, is appropriate: Vietnam’s energy appetite is awake and fully caffeinated. 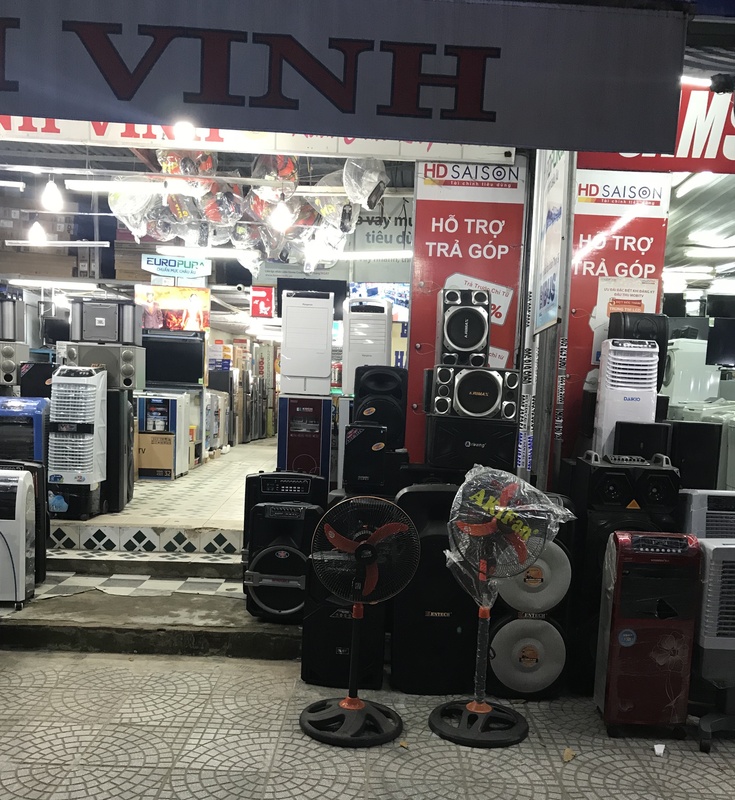 Growing energy demand is good news if you’re in the business of selling appliances in Vietnam, or if you’re a first-time appliance buyer, but it’s also something we need to wrap our collective heads around given the negative externalities associated with energy production. Next Next post: Rebates for Electric Clunkers? Such a tradgedy how could any one do this they are ignorant with no facts of vietnam. Since Vietnam is developing country, the government can provide Solar PV Panel to sustain the electricity of each citizen especially in Rural Areas. Interesting post, as usual, Catherine! I would think that bad air in urban areas such as Hanoi and Ho Chi Minh City is also driving energy demand (and the reverse is also likely true). What’s the end/pause in rising per capita consumption after 2010 about? Might your article include a graph of per capita CO2 emissions in Vietnam versus the US? I suspect per capita CO2 emissions are rising rapidly as a result of air conditioning. If you google Project Drawdown you will see refrigerant management is one of the top ways to decrease CO2 emissions world wide. Should a rising fine on CO2 emissions in the US go to developing and selling ammonia and CO2 air conditioning systems in developing countries like Vietnam? Abandoning communism in favor of markets always increases the wealth and energy consumption of the middle class. The “legacy” of communism has many more negative aspects than everyone being equally poor.